SW Washington’s Fishing at its BEST! Beacon Charters & RV Park welcomes you to come charter fishing for Chinook and Coho salmon (ocean, Buoy 10), White Sturgeon, tuna and more. We’re here at on Washington’s beautiful southwest coast, where the Columbia River meets the Pacific Ocean. 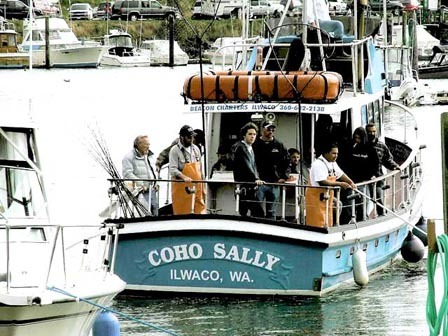 Ilwaco has long been known as the Fishing Capital of the West. Come see why! Our salmon runs are known world-wide. If you’re new to sturgeon fishing, come catch one of these prehistoric fish and you’ll be hooked! Sturgeon fishing is a gentle boat trip and even the kids can haul in a monster fish. 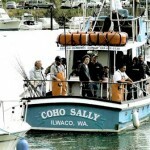 The CoHo Sally has been owned by us and fishing in Ilwaco since 1970. Salmon season opens June 13th and ends Sept 30th or when quotas are met. Sturgeon season is catch and release only for 2015, or when quotas are met. Click for reservation & pricing information. Individual and group rates are available. Trips include bait, tackle, pole, coffee and an experienced skipper and deck hand. Bring warm clothing and lunch/beverages. Don’t forget your camera!